Yesterday evening, between watching the Olympics and a million classroom projects, I saw a commercial for a digital camera. 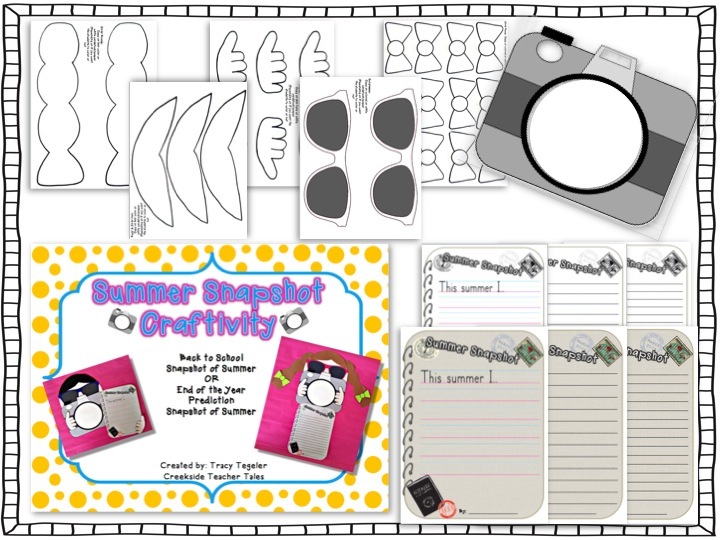 I heard the word snapshot and it gave me a brilliant idea, if I do say so myself 🙂 I have been wanting to create a back to school activity for my students but just hadn’t decided what yet. After this commercial and some chatting with Lyndsey from A Year of Many Firsts, I had my idea all planned out. Students create themselves with colorful sunglasses. 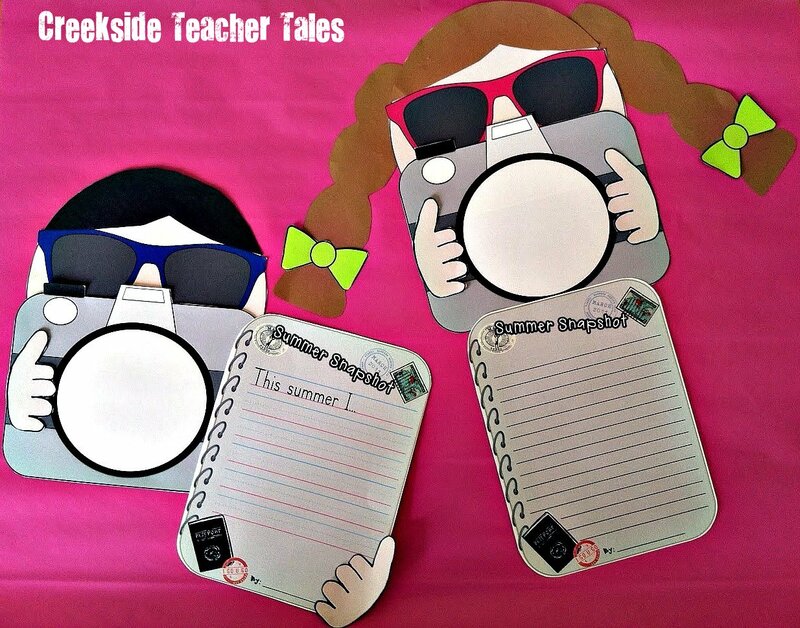 They draw a “snapshot” of their summer in the lens of the camera and then write about the “snapshot” on their journal page. I created 3 different levels of writing pages with colored and blackline versions. For my versions, I printed all of my parts on colored paper except for the writing portion. But the great thing, is that you can decide what is best for your class! You might want them to color every piece, so you copy everything on white paper. Or maybe you would prefer them to color some but not all. Also, maybe the writing piece is not appropriate for your class but the picture can be. It is totally adjustable to your needs! Also, this packet can be used at the beginning of the year or the end of the year. 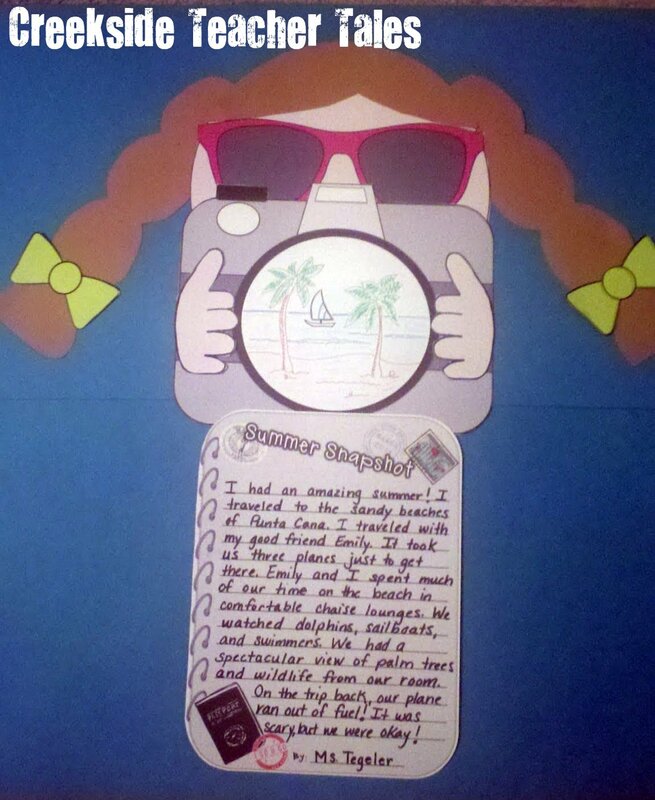 Students can either draw/write a snapshot of their summer or make a prediction of what their summer might be like at the end of the school year. Please click on the picture below to check out this great packet in my TPT Shop. Such a cute writing activity! I need this now! That is so stinkin' cute! Just added it to my cart! Adorable! What else can I say! I've already dropped into my wish list on TpT. What a great activity! I LOVE the design! Your kiddos are going to love this! I love this craftivity! I have put this on my wishlist to buy during the sale! I think it will look really cute on the wall the first week back. Wow these are ADORABLE. We have always done a "tshirt" writing activity, but the kids never really get too INTO it. This is my new back to school writing activity! !